PRTG Network Monitor follows and analyzes your network and requires no third party software. It's quick to download and install. PRTG will be up and running in a just a few minutes including a first auto-configuration. Smart Setup, the built in interactive guidance dialog, will lead you through the whole process. High performance — PRTG's own fast and efficient database system stores the raw monitoring results, as well as logs, toplists, and tickets (outperforms SQL servers for monitoring data), accessible through the Application Programming Interface (API). You can distribute high loads on multiple probes. Low system requirements: An average PC (not older than 2 years) is sufficient and even a netbook can monitor over thousand sensors. For detailed system requirements see here. A built-in SSL secured web server with HTTP and HTTPS support for the user interface. Fast web interface, works as Single Page Application (SPA) to avoid time-extensive reloading of the page. An email server for automatic email delivery. Various notification technologies, for example, email, push, SMS-text messages, syslog and SNMP traps, HTTP requests, event logs, Amazon SNS, executing scripts. In-depth report generator to create reports on-the-fly as well as scheduled reports in HTML or Portable Document Format (PDF). Several report templates are available by default. Graphics engines for user-friendly live and historic data graphs. Data publishing with real time dashboards—private and public—including live performance and status information. You can design these maps as you like with many different objects, as well as you can integrate external custom objects. Multiple languages such as English, German, Spanish, French, Portuguese, Dutch, Czech, Japanese, Russian, and Simplified Chinese. 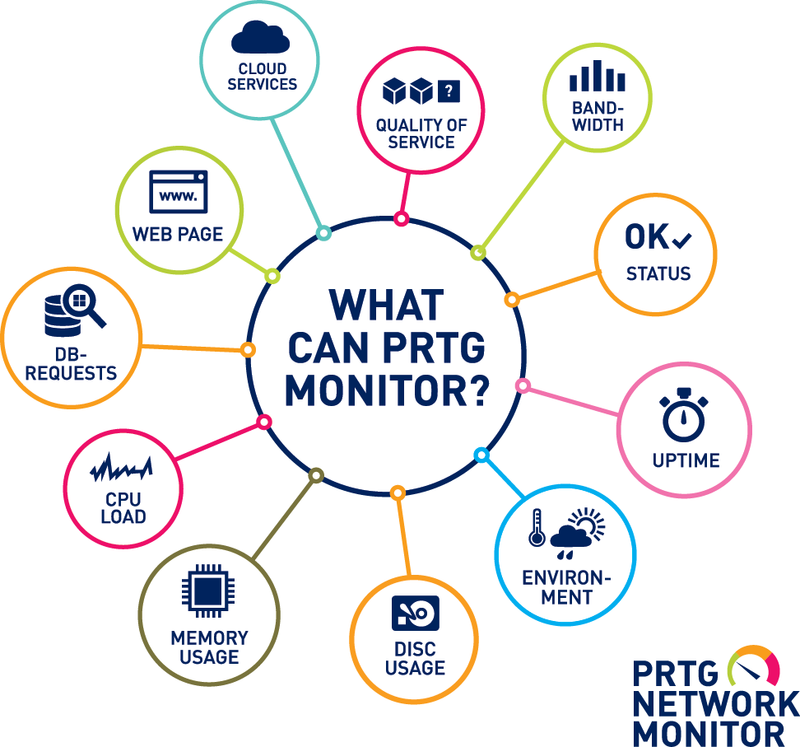 PRTG Network Monitor supports monitoring up to several thousand sensors per installation, depending on various parameters. It can optionally work with multiple remote probes to monitor multiple sites or network segments from one central core installation, and to distribute high loads. You can also configure fail-safe monitoring using a cluster installation to perform automatic failovers. Single failover installations are allowed with every PRTG license. The software is based on the Paessler’s reliable monitoring technology, which is being constantly improved since 1997. We already have more than 150,000 daily users. Our outstanding support ensures your inquiries are answered within one business day for best possible network monitoring. Attractive licensing packages from freeware (up to 100 sensors) to enterprise level (with thousands of sensors) make sure every user finds the best-possible solution.